The Love in the Mist quilt block was a new one to me -- and as is my practice -- I immediately began simplifying it to reduce the number of seams. The look of the end result is the same -- it just is less bulky. 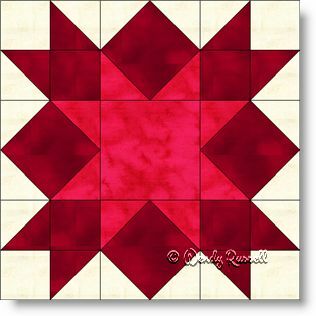 This nine patch quilt block is an easy one to make featuring half square triangles and square in a square patches. The two sample quilts illustrated show blocks set side by side and in an on point layout.